What sort of warp do you choose when the forecast is between 39ºC and 44ºC, that’s 102ºF to 111ºF if you’re still working in Fahrenheit, for the next 4 days? Why Cool Wool of course. Cool Wool was developed in Australia in the 1980s using small diameter merino fibres and special spinning techniques to produce a fine even yarn less hairy than regular wool yarn, specially for making lightweight woollen fabrics which can be worn most of the year. It’s been relaunched recently– thought their sheep were very cool. A local weaver who’s down-sizing had a studio sale late last year and something that moved from her stash to mine were a few cones of Cool Wool yarn, probably from the 1980s. I was inspired by a curtain in VÄV 3/13 which had blocks of mesh and plain weave. 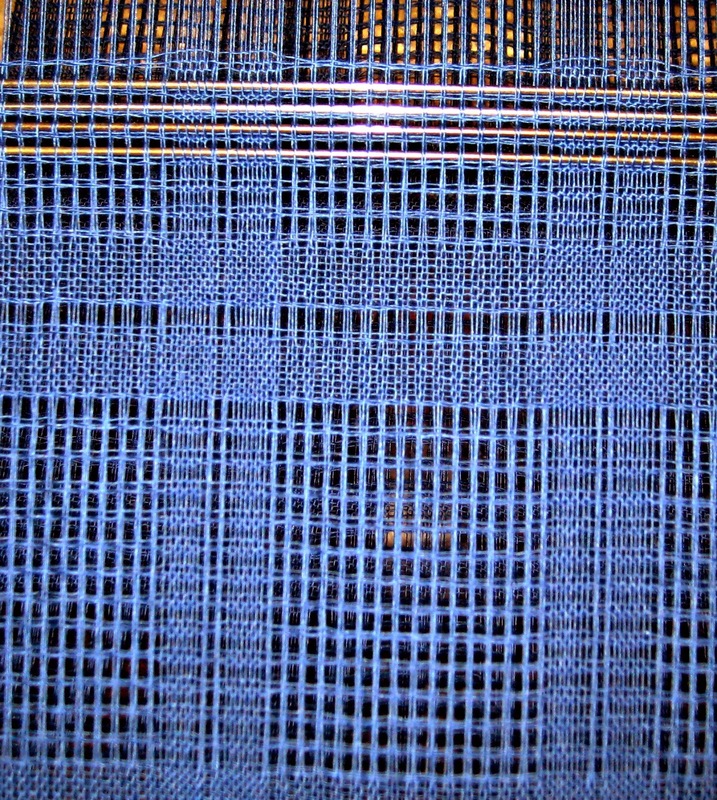 My yarn was a similar weight to the linen in the curtain but I don’t have a 110/10, that is 27.5 dpi reed. My choice was 12 or 15, so went with the 12 initially with the assumption that the holes in the mesh would be bigger, and made the warp long enough for a sample. The warp is made and on the 4 shaft loom. I needed something to keep the spaces even and the 1mm needles from the lace knitting phase were just the thing once I had removed the rust with some steel wool. The first sample, on top, is done and wet finished, and as it was too loose, I did the second, lower, sample, with the 15 dpi reed which has produced a far more stable fabric. The warp faced band is also finished and wet finished but I need to machine the ends of the sections before I start to make up the glasses cases. Unfortunately my machine lives upstairs, the hottest part of the house, so they will have to wait. Fascinating! 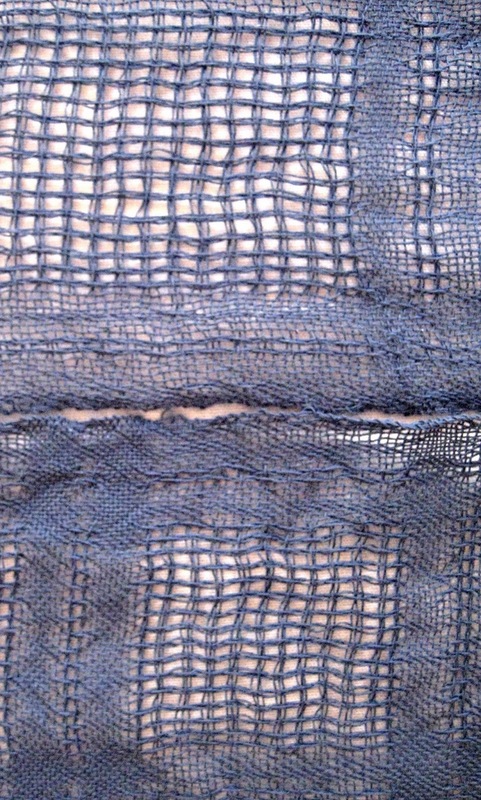 And those mesh scarves are lovely!